WESTBORO, Mass. – As the regular season winds down, Franklin starts to look for challenges not only outside the Hockomock but also outside the South bracket. That means venturing to the 14th annual Westborough Invitational Tournament and a chance to play against potential opponents from Div. 1 Central. On Sunday afternoon, Franklin faced Algonquin, which is on the edge of qualifying for the postseason in a first round game of the tournament, which the Panthers last won in 2011. Led by 14 points and 15 rebounds from senior forward Aubrie Kutil, Franklin pulled away from the Tomahawks to earn a 51-36 victory. Kutil made an instant impact for the Panthers, who were coming off a close loss to rival Mansfield on Friday. The senior was a force to be reckoned with in the paint, scoring seven of the Panthers’ nine first quarter points. Algonquin hung around with a late surge, scoring four points in the final minute of the quarter to cut the lead to just two. Franklin surged again at the start of the second with a 15-5 run that opened the lead to as many as 12 (24-12). Olivia Adiletto started the second with a three on a drive and dish by Kristen Donaghey (three assists) then, after an Algonquin basket, Caroline Maguire (eight points) grabbed an offensive rebound to score plus the foul. Erin Skidmore drove to the basket for a layup and then Lauren Rudolph added four, including a layup off an inbounds play. The Tomahawks came storming back with an 8-0 run, six of those points by Caroline Leonard, and had the lead down to four with fewer than 30 seconds left in the half. Donaghey knocked down a pair of free throws and then a controversial traveling call gave the Panthers possession again with just three seconds remaining. Franklin got the ball up the court quickly and Maguire buried a three at the buzzer that made it 29-20 and left the Algonquin coach fuming as she walked off. Donaghey has emerged as one of the players that Franklin can count on this season. The senior guard scored eight points on Sunday, dished out three assist and pulled in five rebounds. Franklin threatened to pull away throughout the third quarter. Kutil hit a reverse that pushed the lead to 11 then added an offensive rebound and layup on the next possession. As an Algonquin player tried to save a rebound under the Panthers’ basket, Maguire stepped in for the steal and layup and then Welsh found space to cut into the lane for a pair of lefty finishes. The only thing standing between Franklin and a blowout was Elyssa Nichols, who scored all seven of her points in the third and kept Algonquin within 12 heading to the final eight minutes. Algonquin scored the opening bucket of the fourth but Rudolph answered with a three. The Tomahawks then scored the next five points to cut the lead down to just eight with fewer than four minutes remaining in the game. Following a timeout, Franklin looked re-focused and managed to finally put the game away. Kutil cut across the lane and kicked it out to Skidmore for a big three right in front of the Panthers bench that made the lead 11 again. Rudolph (nine points) added a pair of free throws and Donaghey wrapped up the win by getting into the lane for a floater. Franklin, which is the No. 2 seed in the tournament, advances in the winners’ bracket and will face No. 3 seed Acton-Boxborough, which edged Holy Name 44-40, on Tuesday at 5:15. 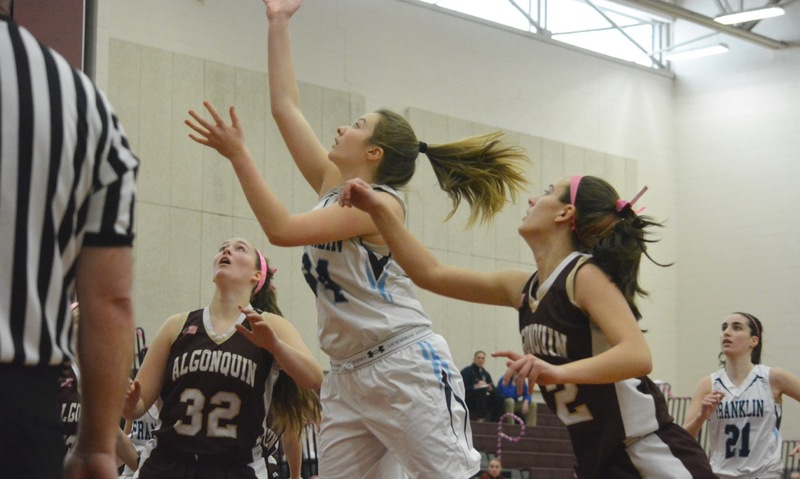 Franklin, 51 vs. Algonquin 36 – Final – Aubrie Kutil led the way for Franklin with 14 points and 15 rebounds. Lauren Rudolph added nine points and Caroline Maguire and Kristen Donaghey each added eight for the Panthers. Franklin advances to face Acton-Boxboro in the semifinal of the Westborough Invittational. Attleboro, 88 @ King Philip, 66 – Final – Senior Kyle Murphy scored a career-high 21 points, pulling in eight rebounds and picking up three steals. Jake Dunkley paced the Bombardiers with 12 of his 17 points in the opening quarter, Berlyns Abraham had 12 points and six rebounds and Andrew Milliken also chipped in with 12 points. Canton, 47 @ Oliver Ames, 70 – Final – Carter Evin scored 20 points and hauled in nine rebounds and Nick Welch came off the bench to net 14 points. Tony Harris scored a team-high 14 points for Canton. Foxboro, 72 @ Stoughton, 55 – Final – Foxboro senior Jason Procaccini led all scorers with a game-high 21 points while Alex DuBrow (13 points) and Mark Clagg (11 points) also scored in double figures. Stoughton’s Jared Maher had 14 points for the Black Knights. Franklin, 72 @ Taunton, 83 – Final – Quan Roberson scored a career-high 25 points and hauled in eight rebounds to go along with a pair of steals, blocks and assists to lead the Tigers. Jose Mercado added 19 points and seven rebounds, Tommy MacLean had 17 points, five assists and four rebounds, Dom Smith had 13 points, eight rebounds and three assists and Carlos Borrero had seven points, nine rebounds and five assists. Tim Prunier led Franklin with 20 points, four assists and three rebounds, sophomore Paul Mahon finished with 19 points, five rebounds and six steals and freshman Jay Dieterle had 17 points and seven rebounds. Sharon, 56 @ Milford, 57 – Final – Dimitry Torres hit a layup going across the paint with 4.3 seconds left to put the Scarlet Hawks ahead, then holding off a last second shot from the Eagles. Torres finished with a team-high 19 points while Zack Tamagni notched a double-double with 16 points and 10 rebounds, having hit a half court buzzer beater to tie the game at the end of three. Kayden Kelley had seven points and 10 rebounds and Dwight Anderson added 10 points and seven rebounds for Milford. Mansfield, 66 @ North Attleboro, 49 – Final – The Hornets held just a two point advantage at halftime and then just six at the end of three quarters but won the final quarter 23-12 to pick up the win. Sam Goldberg was a perfect 5/5 from the field for a game-high 13 points, also grabbing seven rebounds. Max Boen added 12 points and Matt Ehrlich had 10 points for Mansfield. Chad Peterson led North with 12 points while Brent Doherty and Jonny Friberg each added nine points. Oliver Ames, 58 @ Canton, 29 – Final – Kayla Raymond led the Tigers with 12 points while Hannah Carroll added 11 and Francesca Calabraro had 10 points. Emma Murphy was Canton’s top scorer with 10. The two teams joined together for Play4Kay Pink Night to raise money for breast cancer research. Stoughton, 38 @ Foxboro, 83 – Final – Cassidy Harrison and Ashley Sampson each scored 18 points for the Warriors, who had five players reach double figures. Hailey Maling added 13 points, Grace Tamulionis scored 12 points and Lily Sykes finished with 10. Taunton, 30 @ Franklin, 65 – Final – Erin Skidmore paced the Panthers with 15 points. Aubrie Kutil added 12 points and Catherine Gray had 10 for Franklin. North Attleboro, 30 @ Mansfield, 45 – Final – Meg Hill led Mansfield with 12 points and nine rebounds, while Jackie Carchedi had seven points and nine boards and Jen Peel had five points and six assists. North was led by Liz Morehouse with eight points and Ashley Ahern who scored all seven of her points in the fourth quarter. Milford, 53 @ Sharon, 46 – Final – Kate Irwin led the way for Milford with 13 points and Nicole Dahlgren added nine for the Hawks. Sharon was led by Alyssa Piazza who had a double-double of 16 points and 10 rebounds, while Charlotte Ransom added 13 points, five rebounds, and four steals. Mansfield/Oliver Ames, 3 @ Medfield, 6 – Final – Cat Luciano scored a pair of goals for the Warriors while Lilly Feeney added one. FRANKLIN, Mass. – With the game slipping away in the second half, turnovers piling up, and shots clanging off the rim, Mansfield looked like it was on the brink of picking up its first league loss of the season. Then the Hornets found a second wind, and their shooting touch, to pull out the win. Seniors Jackie Carchedi, Caroline Maher and Jen Kemp knocked down three straight shots from beyond the arc to turn a three-point deficit into a three-point lead. After four free throws were matched by a pair of Franklin layups, the Panthers had one more chance to send the game to overtime but Carli Koffinke’s shot went halfway down and rimmed out. Mansfield battled back in the fourth quarter for a 51-48 road victory over its rival that keeps the Hornets one game in front of Attleboro at the top of the Kelley-Rex division standings. The Hornets led 24-16 at halftime thanks to a big second quarter from sophomore center Meg Hill, who scored eight of her game-high 17 in the frame. Hill also added four blocks and finished with a game-high 11 rebounds. The Mansfield defense was also smothering Franklin. The Panthers did not hit double digits until there was 1:40 left in the half. While the half was a struggle, Franklin did find a little momentum before the break. Kristen Donaghy and Margaux Welsh each knocked down threes and sophomore Grace Sameski scored on an offensive rebound to cut the lead to eight. That energy certainly carried over to the second half. The Panthers stormed out of the locker room and took over the game, scoring the first 15 points of the third quarter and completing an 18-2 run that gave Franklin its biggest lead at 34-26. Mansfield went zone to combat Franklin’s success off the dribble, but the Panthers were able to use Aubrie Kutil (eight points, nine rebounds) in the high post to draw the wing defenders into the middle and open space for the shooters. Lauren Rudolph (11 points) suddenly had space and hit a trio of threes, including one of a step-back that had the Panthers bench on its feet. Mansfield helped out by turning the ball over in the third quarter. Redding admitted that the Hornets were “rattled” in the second half but Juliana Newell hit a jumper and Maher (six points) finally found the range on a three that cut the Franklin lead to 36-31 heading into the fourth. Hill scored to start the quarter and cut the lead to three but junior Catherine Gray got inside and answered with a three-point play on the other end. With Franklin leading 41-35, Carchedi (nine points) hit a three only to have Welsh (six points) answer right back. A minute later, Carchedi knocked down another big three then Jen Peel (10 points, eight assists) threw a perfect cross-court pass to Maher who was open in the corner and tied the game at 44-44. Carchedi was forced to the bench after a hard collision on defense (she also went flying into the stands to save a loose ball in the first half, knocking over the water jug and scattering fans behind the Franklin bench). In her place, Kemp stepped up and made her only shot from the floor to give Mansfield the 47-44 lead. Peel and Carchedi each hit a pair of free throws and Olivia Adiletto answered each time with layups on the other end to keep the lead at three. After a missed front end of a one-and-one, Franklin had one last chance with 12 seconds left. The Panthers swung the ball around to Koffinke in the corner and her shot looked pure but somehow bounced out allowing Mansfield to breathe a sigh of relief. Redding could only shake his head at another grueling night in the Hockomock. No complaints for the Mansfield coach, as his team remains in first. Mansfield (9-2, 7-0) will be home on Tuesday to host Foxboro. Franklin (4-4, 3-4) will host Stoughton. Attleboro, 43 @ Taunton, 65 – Final – Taunton junior Quan Roberson netted a game-high 20 points while senior Dominique Smith added a career-high 18 points for the Tigers. Tommy MacLean added 11 points and Jose Mercado had 10 points. Attleboro’s Jake Dunkley had nine points and three rebounds and Lucas Boucicaut also had nine points. Kyle Murphy pulled in 10 rebounds for the Bombardiers. Canton, 42 @ Sharon, 47 – Final – Sophomore Malik Lorquet made a big splash in his first full varsity game with nine points and 10 rebounds. Junior Adam Banks also scored nine points for the Eagles. Woanyen Mahn and Rishi Jambunathan each scored nine points for Canton. Foxboro, 54 @ Oliver Ames, 50 – Final – Foxboro built a seven point lead by halftime and held on in the second half. Senior Jason Procaccini led with 18 points with classmate Alex DuBrow chipping in with 17 points. Oliver Ames junior Carter Even had 17 points and seniors Shawn Cardoza and Tim Kelley each had 12 points. Franklin, 60 @ Mansfield, 57 – Final – Freshman Jay Dieterle hit a three with 1:34 left to put Franklin ahead for good. The Panthers, which led by as much as 22, had to stave off a rally from Mansfield over the third and fourth quarters. Franklin sophomore Connor Peterson scored a career-high 23 points and had seven rebounds, Tim Prunier added 15 points and five assists, sophomore Paul Mahon added eight points and six rebounds and Dieterle had six assists to go with five points. Matt Ehrlich had 16 points and five rebounds for Mansfield and Max Boen added 11 points. North Attleboro, 47 @ King Philip, 53 – Final – Juniors Will Weir and Noah Goodwin each scored 13 points for King Philip with senior Ben Smith adding 10 points and junior Pharaoh Davis netted 10 points. North Attleboro junior Brent Doherty scored a career-high 24 points for the Rocketeers. Milford, 60 @ Stoughton, 77 – Final – Stoughton senior Brandon Teixeira logged his league-leading sixth double-double of the season with 22 points and 11 rebounds as the Black Knights enjoyed a strong shooting night from the floor. Junior Ryan Sullivan added a career-best 16 points for Stoughton. Milford junior Nate Davila scored a team-high 18 points and Dwight Anderson added 13 points. Sharon, 41 @ Canton, 43 – Final – Meaghan Hunter led the way for the Bulldogs with 17 points and Emma Murphy added 13, including nine in the fourth quarter. Alyssa Piazza was the top scorer for Sharon with 14 points and Ashley Mukasa added 10. Oliver Ames, 53 @ Foxboro, 38 – Final – The Tigers had the lead throughout in a key Davenport Division matchup. The Warriors got within one in the third quarter but OA answered with a three to keep the lead. Sophomore Kayla Raymond notched her first double-double with 21 points and 11 rebounds while Hannah Carroll added 10 points and Francesca Calabraro had eight points and nine rebounds. 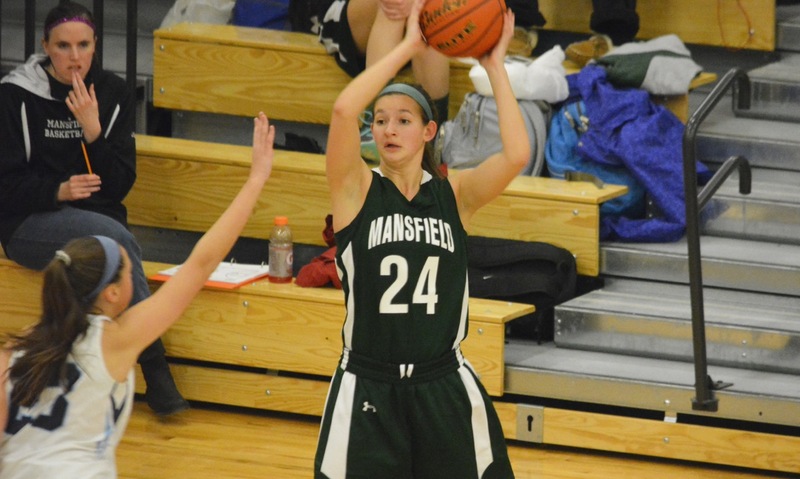 Mansfield, 51 @ Franklin, 48 – Final – Meg Hill was the top scorer for the Hornets with 17 points and 11 rebounds. Jen Peel added 10 points (eight in the first half) and eight assists for the Hornets and Jackie Carchedi scored nine points (eight in the fourth quarter). Lauren Rudolph led the Panthers with 11 points (nine in the third quarter) and Aubrie Kutil had eight points and nine rebounds. King Philip, 34 @ North Attleboro, 49 – Final – North Attleboro got 10 points apiece from Julia Feid and Emily Haskell. KP was led by Sam Madden and Riley Dalzell, who each scored seven points. Stoughton, 59 @ Milford, 41 – Final – Julia Foye came off the bench to drain a trio of three pointers and finished with 11 points to spark the Black Knights. Alecia Quinones led Stoughton with a team-high 20 points and added seven steals. Taunton, 26 @ Attleboro, 63 – Final – Sarah Deyo returned for the Bombardiers with 20 points and 10 rebounds and sophomore Sam Pierce chipped in with her fourth straight double-double, 18 points and 11 rebounds. Emma Vlashi also had 11 boards for Attleboro.